The train route is split into three sections, all joined to form a giant loop around Exmouth linking the beach to the town. You can ride each section for just £1 each or a complete loop for £3. Your conductor will be happy to sort your tickets before you board the train. Please ensure pushchairs are folded before boarding. If you require any help, just ask! We depart Maer Road Car Park on the hour. The first train leaves at 10 am & the last train leaves at 4 pm to complete a full circuit before parked for the night. Although not a park & ride, the Exmouth Land Train can make parking all day at the Maer Road Car Park the cheapest in Exmouth! Travel on the train and you can save money on your parking at Maer Road Car Park. Pay £6 for all day parking with cash (not by phone) at the parking metre and hand the conductor the second part of your parking ticket, we will give you £3 off your ticket on the land train! Maer Road car park is convenient for the beach and the Maer and to be away from the crowded town centre car parks. Exmouth Lifeboat Station houses both an inshore ‘D’ Class lifeboat and also an all-weather Shannon Class Lifeboat. There is a viewing gallery for the Shannon and also a souvenir shop. This stop is also ideal to explore Maer Rocks at low tide for crabbing and Rock pooling. Public toilets and a refreshments cafe is available at this stop. We depart Exe Fishing at 8 minutes past the hour. First train is 10.08am, last train is 4.08pm. This stop has tons of things to do for all the family, we have fishing trips in Exmouth with Exe Fishing, ideal for young adults and older alike on the Southern Angler or if you fancy something a little more regal, why not try the swan boats in Exmouth Amusement park? There is also fantastic ice cream on offer though join the queue, this is a popular ice cream hut. Had your fill of ice cream? Why not walk over the road to the Amusements, watch a game of cricket, play on the crazy golf or let the kids bound around at Jungle fun? We depart Exmouth Seafront stop at 11 minutes past the hour. First train is 10.11am, last train is 4.11pm. Jump off here to visit Exmouth Pavilion and book tickets for a show or maybe let the kids enjoy the swing boats and roundabout. Located here also is Aby’s Channel View serving home cooked food including breakfast, main meals. snacks and desserts as well as coffee and cake and Devon Cream Teas! We depart from this stop at 14 minutes past the hour. First train is 10.14am, last train is 4.14pm. This stop is perfect for anyone staying in a seafront hotel such as the Cavendish, the Imperial, Premier Inn or the Grand. It is also located at the dog-friendly section of Exmouth Beach. We depart from Stuart Line Cruises at 25 minutes past the hour. The first train is 10.25am, the last train is 4.25pm. Stuart Line Cruises is a family run business first started in 1968 and currently in its third generation. The brightly coloured red, yellow and blue boats sail the River Exe throughout the year. They also sail the South and East Devon coastline during the summer months. The boats are all weather, family and dog-friendly and offer value for money for everything from small groups to large groups. We depart from this stop at 35 minutes past the hour. The first train is 10.35am and the last train is 4.35pm. 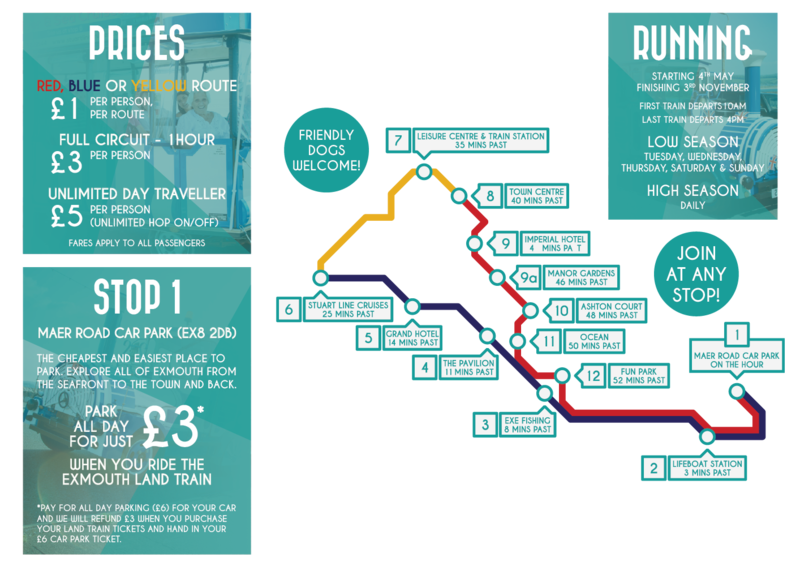 This is the ideal stop to get to Exmouth Leisure Centre and also to the Train and Bus station for ample links to Exeter and beyond. This is also a great stop to get to Exmouth Rugby Club and the town centre short stay car park. Stopping off right by Exmouth cinema and The Strand, we depart from the Town Centre at 40 minutes past the hour with the first train arriving at 10.40am and the last train at 4.40pm. just listen out for the bell as we come round the corner. The Strand is often the centre for a wide range of markets and events throughout the year and a farmers market coming on a regular basis. The Exmouth Land Train crew are a wealth of knowledge as to where to eat and drink and the Strand is an ideal stop to explore local eateries. This stop is also ideal for exploring the wealth of independent shops around the Strand and through the Magnolia Centre. You will find everything from homemade Italian Gelato through to handcrafted gifts, fashion and local drinks. This is one of the more popular stops on our route and we advise, if you have a pushchair or wheelchair, to fold up before you board the train where possible. Please ask a member of the crew to help you if needed. Departing at 48 minutes past the hour, you can jump onboard right outside the Ashton Court Hotel that overlooks the picturesque seafront and commands fantastic views across Lyme Bay towards Berry Head. With the first train is arriving at 10.48am, the last train departs the stop at 4.48pm ending up at Maer Road Car Park. The view encompasses Dawlish Warren and the Exe Estuary as well as some of Exmouth seafront. We depart the Ocean stop at 50 minutes past the hour. The first train arrives at 10.50am and the last train is at 4.50pm heading to the Maer Road Car Park. Ocean is one of the newest buildings on Exmouth seafront and comprises a restaurant and bowling alley on the ground floor, Exmouth’s largest soft play zone and cafe on the first floor with a stunning private function suite on the top floor. You can even get married on the top floor balcony that has commanding views over Exmouth seafront and is a perfect stop off for the Exmouth Land Train during a private hire for you and your guests. This stop is ideal also to visit the Exmouth Fun park and explore Exmouth’s sandy beach at the section with the most facilities (including public toilets). There is also a range of great ice cream flavours at the ice cream hut a short 1-minute walk away. The Fun Park is a must for anyone with children, here you have crazy golf and a boating lake to name but 2 things to do! We depart this stop at 52 minutes past the hour with the first train arriving at 10:52 am and the last train heading for the terminus of Maer Road Car Park at 4:52 pm. There’s lots to do at the Fun Park which resides opposite Exe Fishing, stop 3, on the route. Many a childhood has been spent playing in the playpark, on the boating lake or trying to get a hole in 1 on the crazy golf course (I think I became an expert at this). It is also an ideal stop to jump off from if you want to spend the day at the beach before jumping back on the train at stop 3 in the afternoon.